Jatropha trees belong in the family Euphorbiaceae and are Central American natives. 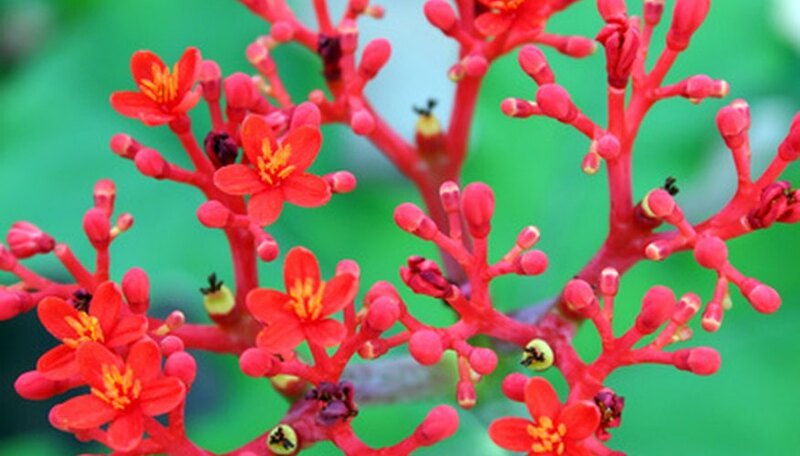 Considered a small tree, as it only grows approximately 10 feet in height, jatropha is well adapted to growing in the ground in the subtropical and tropical regions of the country. There are many cultivars of jatropha, with some varieties deciduous. Trees can live up to 50 years. Hardy and drought-tolerant by nature, jatropha is a welcome addition to landscapes with its sprays of year-round red flowers. When transplanting jatropha trees, gardeners will have the most success moving young, healthy trees, as transplanting is a shock to the plant’s system. Transplant the jatropha in spring for best results. The growing season has just started, and the tree will have time to establish itself into its new planting site before the winter. Water the jatropha every day for two to three days before the transplant occurs. Gardeners will have better success transplanting the tree with a moist root system than one that is dry. The water will cut down on the transplant shock. Tie up the jatropha’s branches before starting the transplanting process. This will prevent any injuries sustained during the process of digging, transporting the tree to the new planting site and planting it in its new location. Mark the jatropha’s trunk on one side, so the tree is oriented in the same general direction when placed in its new planting site. The tree will adapt better in its new location if growing in the same direction as before. Dig around the jatropha approximately 15 to 24 inches in depth to sever the roots. Allow the root ball to be approximately two-thirds as large as the canopy spread of the tree. This will assure a large majority of the root system transplants with the jatropha in its new planting site. Dig underneath the jatropha’s roots after severing the outside root system. Use loppers to cut any large roots. Transport the jatropha in a wheelbarrow or on a tarp, so more damage does not occur to the root system. Do not drag the tree by its trunk or damage will occur, causing more stress. Dig a hole in the new planting site that is two times larger than the root ball. This will loosen the surrounding soil allowing the jatropha’s roots to spread out in the area as it begins to grow. Water the hole thoroughly before planting the tree. Place the jatropha in the hole facing in the same direction it was growing in the original planting site. Fill the hole halfway with soil; pack down with your foot and water. Fill the remainder of the hole with soil, pack down again and water, being sure the water reaches the root system. Water the tree daily for approximately two weeks, depending on local weather conditions. Taper off the watering as the tree begins establishing itself, eventually cutting down to approximately one to two times per week. Mulch around the base of the tree to keep the area moist. Purdue University: Jatropha Curcas L.